Water-cooling is the arguably one of the most defining factors of a true PC hardware enthusiast. 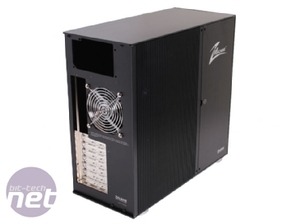 Just by seeing someone with a water-cooled machine, you immediately know that they are someone who has a great deal of enthusiasm and respect for their hardware – why else would they go to the trouble of using water over air cooling, considering the significantly higher costs, maintenance and chance for failure cooling using water brings with it? Using watercooling is a labour of love, be it to unlock more processor overclocking potential or silence your system. It elevates you above just throwing off the shelf parts together, and becomes a badge of honour you can wear on hardware forums with pride. 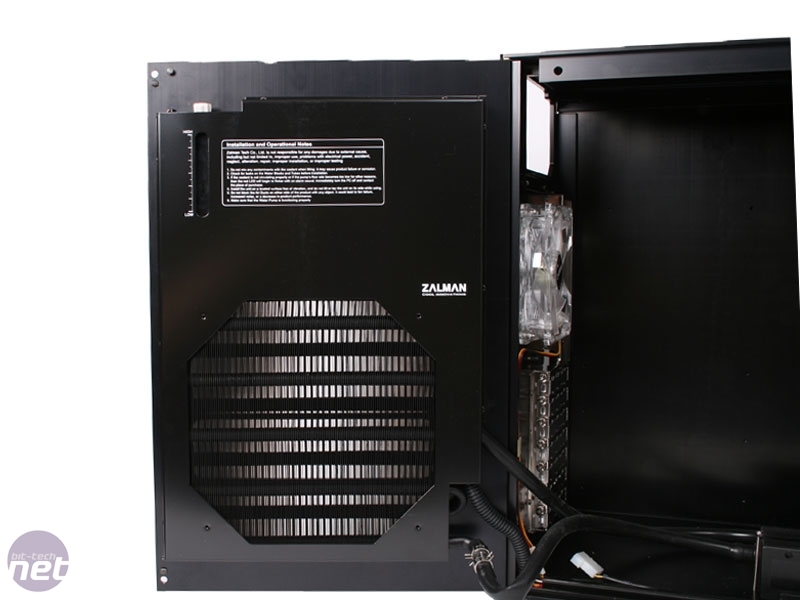 So we’re unsure how to feel about today’s case, the rather exclusive Zalman ZMachine LQ1000, which features a pre-installed watercooling setup. With the pump, reservoir, radiator and control gauges all fitted before you even open the box, all you’ll need to do is mount the water block, fit a pair of hoses and fill the reservoir and you’ve got a fully fledged water-cooling setup without any of the mess and fuss of crimped hoses, leaks or lengthy build time. 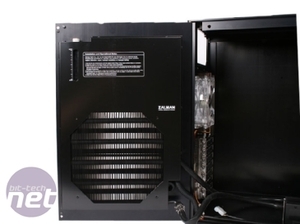 Zalman certainly has a reputation for producing innovative cooling products, and the LQ1000 seems to be no exception by making watercooling, dare we say it, easy. 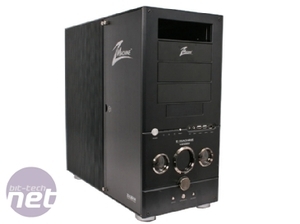 Whether this ZMachine can start to justify its enormous price tag though is something that’ll weigh heavily on our minds. 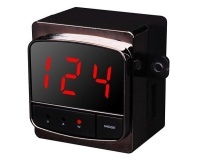 The LQ1000 wastes no time in showing its class, and as soon as you set your hands upon its black aluminium surface you get a feeling for the quality of the materials used – it just feels classy, with a slight texturing to the 4mm aluminium plate used for all the exterior panelling that it draws your hands to it - you just can't stop touching it. Yes, that’s right, 4mm aluminium plate – the exterior panelling of the LQ1000 could probably be used as a make shift bullet proof vest because it’s so chunky, and the side panels and fascia panel are even thicker, 7mm and 5mm respectively. 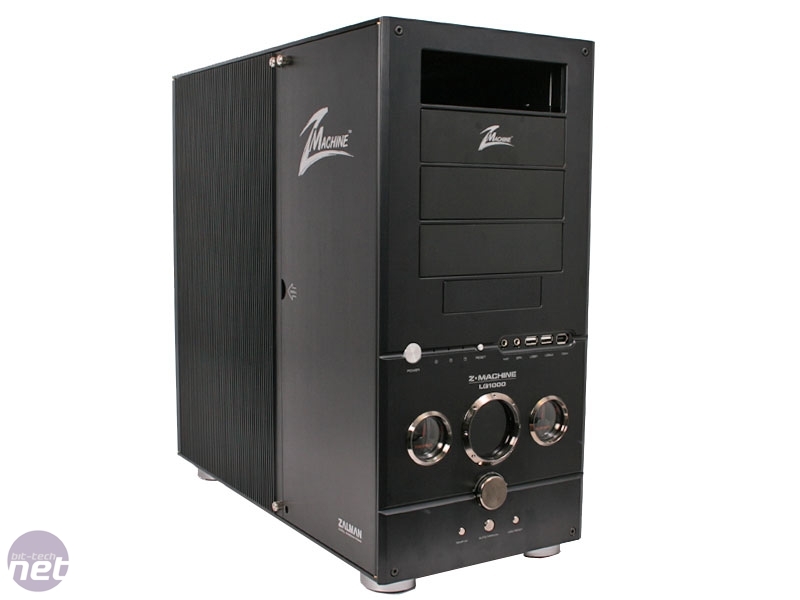 Sadly this means that the LQ1000 is a heavyweight when it comes to aluminium cases, tipping the scales at a whopping 15kg, although a rock solid build is a welcome trade off. Every panel fits together perfectly, every edge is beautifully machined – the build quality is simply faultless. 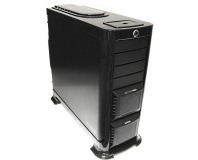 Design wise, both sides of the case use a dual door system, with identical smaller doors at the front of the case for accessing the HDD and 5.25” bays and larger specialised door/panels providing access to the motherboard and the rest of the case interior. 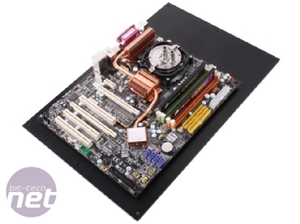 In fact, the right hand side “door” is more a combination of side panel and removable motherboard tray, and after removing a handful of Allen key screws, drops completely out to allow easy motherboard and water block installation. That's not to say that removing half a dozen screws per side is easy mind, even with thumbscrews that's excessive. The completely removable motherboard tray-slash-side panel is a well thought out design feature though, and means that even with the water-cooling system filled and fitted; swapping out hardware all the way up to motherboard shouldn’t be too tricky – just remove the water block and PCI cards, then unscrew the rear panel and you're golden. The left hand door, which is mounted on well balanced hinges, houses the watercooling loop’s radiator, flow meter and reservoir, and as with the right hand panel, is ribbed on the exterior. Originally the LQ1000 was to be a completely passively cooled system enclosure, with these small fins increasing surface area for improved cooling, but now they’re here for purely cosmetic reasons as the radiator's cooling is handled by an enormous 240mm blowhole cut into the side panel. However, the quality of the build materials and the precision of the grill cutting means that it’s difficult to notice the blow hole unless you’re looking at it dead on. There’s plenty of attention to detail too, with all the hinged doors fitted with fairly strong magnets to keep them closed when not screwed shut, and a blue back lit flow meter recessed into the door to reassure you that the water is still flowing inside.